The feast of the Sacred Heart on the 3rd of June was a very special day in Faisalabad, because it was the Robe Taking day for two postulants, Robin and Taimoor. The new postulants are among a growing number of young men in Pakistan who have felt called to the vocation of the De La Salle Brother. Holy Mass, which included the Robe-taking Ceremony, started at 11 am with Affiliated Member, Father Francis Bashir presiding. The liturgy was organised by Brother Qumar John and the Aspirants made up the choir, under the guidance of their music teacher. Brother Shazad Gill, representing the Superior General,led the Robe-taking Ceremony. The community was happy to welcome Robin's and Taimoor's families plus four Brothers from the Khusphur Community. Brothers Gregory and Aloysius had the privilege of being Robin's and Taimoor's sponsors. After Mass and congratulations to the two new Pre-Novices, a celebratory meal was hosted by the Faisalabad Community with the Aspirants as guest masters. The Pakistan Sector of the District is grateful to Brother Vincent Keating for preparing Postulants Robin and Taimoor for this special day. 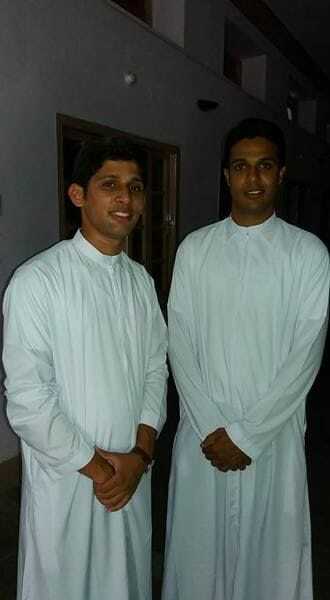 The two new Pre-Novices flew back to Sri Lanka that evening where they will undertake the Pre-Novitiate programme.